I've written about Beverly Hills, 90210 quite a few times in the past several months. However, since I'm currently at the Beverly Hilton for an event (and I routed myself to the address that does indeed include the famed zip! 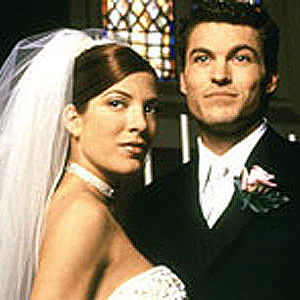 ), plus SOAPnet's daytime run of the show recently finished a run and is back at the early years of the show, I wanted to look at one more thing from it. The final few episodes (um, yes, there will be spoilers if you haven't seen the show) deal with David and Donna's wedding. I was shocked the first time I saw this episode, as the lead-up was pretty short, though I guess they were just running out of time after ten years. I mean, wouldn't you think that Donna would want more time to plan a wedding?!? The respective bachelor parties were funny, with Mrs. Teasley making an appearance and Donna's, and the randomly-seen Muntz showing up at David's. But what i wanted to share today was the poem that Steve wrote for David's party, detailing the girls that he had been with throughout the show. I was thrown back by how many girls are mentioned, as I always thought of Brandon and Steve being the ones who had the many girlfriends on the show! Davey Silver was his name. For they'd heard of Davey's bedroom deeds. Was the first into our David's lair. Till a girl named Ariel came through David's door. Sophie and David took it all the way home. Denise was fun, and Carole too. That made poor Dave blue. And Robyn who hated his radio personality. Marta the artist, wasn't she fun? We thought it might last. But come on, guys: get real! Her name's Donna, she's fine. My God, Silver: it's about time! Now, the internet nitpickers have seemed to agree that there's a girl missing from this list. From an early episode that I can only barely remember (where Donna, David, Kelly, and Steve go to Palm Springs to see David's grandparents), there was a girl named Tuesday. But otherwise, it seems that David's conquests all made it into Steve's poem... all fourteen of them! That seems like a lot to me, especially when I think about how long some of these characters were around, LoL. Do you remember all of these (de)lovely ladies? Most of the time bacholer parties have no theme, people can wear whatever they want and can do whatever they like.